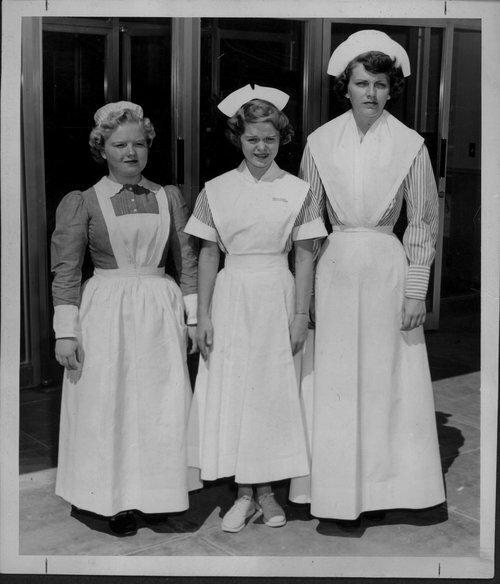 This black and white photograph shows freshman student nurses from the Stormont-Vail Hospital in Topeka, Kansas. To the left, Darlene Dial from Holton, Kansas, is wearing a nurse's cap and uniform that was originally worn by Edith Dodds, the first graduate of Christ's Hospital in Topeka, Kansas in 1894. While Donna Jamrard of Chapman, Kansas, center, is wearing a nurse's uniform from the 1960s. To the right, Beverly Fosdick from Wakefield, Kansas, is wearing a cap and uniform from 1904, it was previously worn by Katherine Stayer, the first graduate of the Jane C. Stormont Hospital and Training School for Nurses, in Topeka, Kansas.